eimuntas nekrosius | aldo miguel grompone d.i. Eimuntas Nekrosius is considered one of the most important theatre directors among the European scene. 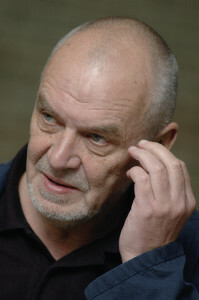 Lithuanian, born in Vilnius in 1952, his theatre career begins with two different performances with the same amazing force and originality: “Uncle Vania” by Anton Chekhov, and “Pirosmani, Pirosmani” (1981), a portrait of the famous Georgian painter Niko Pirosmani, in which works of art images and words are in perfect harmony. His theatre journey continues with the mise-en-scène of “Mozart and Salieri. Don Juan. Plague” after the three short dramas by Pushkin. Death is the primary theme of this play: the death of Mozart at the hands of Salieri, the death of Don Juan, dragged into the hell by the handshake of the Commendatore, that got him the Europe Theatre Prize in 1994. The “Three Sisters” (1995) by Anton Chekhov, won the Italian Ubu Prize as the best foreign performance. And has been presented and awarded at many international festivals. About this performance the critic has said: “Among the many “Three Sisters”, seen in different languages and by different directors, the one of Nekrosius is probably the most original, inspired by an amazing inventiveness … that lights up the script with an unusual efficacy. All these productions are not anymore available or in the repertory of the Company. And the new creation “The Hunger Artist” by Kafka to be presented in Vilnius on November 12, 13 and 14 2015. “Meno Fortas” was established on January 1998. Its main activity of “Meno Fortas” is the production and promotion of the work of Eimuntas Nekrosius in Lithuania and abroad. Also the mission of “Meno Fortas” provides for creation, coordination and implementation of international professional theatre projects, supporting young professional artists .Facilities by “Meno Fortas” are open for seminars chamber performances and concerts. Each year “Meno Fortas” presents world wide more then 50 performances, which are expected and well accepted by audience and theatre critics and professional of different countries.